Bishop Charles Bromby, the Second Anglican Bishop of Tasmania, arrived on 7th January 1865 from Plymouth. He was the second son of Vicar John Bromley of Kingston-Upon-Hull and former Headmaster of Stepney Grammar School, joint founder of Cheltenham College and of the Cheltenham Ladies' College. In 1847 he became the first principal of St Paul's College, originally the Cheltenham Normal School for teachers in the National schools. In April 1850 he shifted it from Monson Villas to fine new buildings which he planned and supervised himself at St Julia's. As editor of the widely-read periodical Papers for the Schoolmaster he had great influence. Prominent among educational workers in England he wrote pamphlets condemning Robert Lowe's 'Revised Educational Code', but it became law in 1862. He also published many other works on education and religious subjects. Control of the College was not always easy. The Executive Committee interfered, and Bromby on his part, would not readily submit to authority. Although it was resolved in 1849 that Bromby's rules should be recognised "in order to uphold the sole supremacy of the Principal", a monthly report was demanded of him. "Laws," wrote Bromby, "are for the disobedient. Those of our land fill many folios because our land is full of the disobedient. To enact laws, where laws are not wanted, is almost to challenge the good to deeds of evil." By February 1854, 462 teachers had already been trained, "scattered over the Kingdom or labouring in foreign missions." In April 1855, HM Inspector Professor Moseley reported for the last time. He wrote, "The Principal is the best teacher I have ever heard." The "Revised Code" became law in 1862. What Bromby predicted came to pass. The quality of teachers declined. The standard of admission to training colleges was lowered. Bromby was disappointed. "....in the name of a progressive civilisation...I beg you to consider what I say." He could not convince the government. The ill-effects of the "'Revised Code" spread throughout England. After this fractious period, Bromby sought preferment in the Church and the executive committee of St Paul's College enlisted help from its president, Anthony Ashley Cooper, seventh earl of Shaftesbury (his wife's maternal uncle was Lord Melbourne and her stepfather (and supposed biological father) Lord Palmerston, both Prime Ministers). After F. R. Nixon resigned as bishop of Tasmania, Bromby was appointed to the vacant see in April 1864. He was consecrated in Canterbury Cathedral on 29 June and in September sailed with his family from Plymouth; on 7 January 1865 he arrived at Hobart Town and was installed as bishop. In 1869, the Church rented 26 Fitzroy Place and then named it Bishopscourt. After much debate, the Church bought the house in 1876: “every Australian Diocese, I believe, has erected a suitable residence for the Bishop except Tasmania…An opportunity now offers itself for the purchase of the House which I now occupy, standing upon nearly three acres of ground”. Bromby offered £200 of his salary to help fund the purchase. He successfully dissociated the Tasmanian Church from state control and interference, and his tact resulted in the State Aid Commutation Act of 1868. He also provided the Anglican Church in Tasmania with an adequate legal setting and an effective system of government. In seeking consolidation within his own diocese and with those of the other colonies he saw, probably more clearly than any bishop of his day, the need for an Australian general diocese with legislative rather than advisory powers. Bromby recruited many new clergy for Tasmania and in an extensive building programme gave unreserved support to the new St David's Cathedral in Hobart. The plan was provided by his brother-in-law, G. F. Bodley, and the Duke of Edinburgh laid the foundation stone in January 1868. The first service in the cathedral was on the last Sunday in 1872 and the nave was consecrated by Bishop Short of Adelaide on 5 February 1874. "Bishopscourt" exerted its greatest influence during the Cathedral era. Mrs Bromby made the home a diocesan one. Hospitable and gracious, the Bishop's wife gave welcome to the clergy and their wives and "to other people of note". Officers from visiting ships almost invariably called at "Bishopscourt". If the welcome were generous, the entertaining was precise. Punctuality and decorum marked the "Bishopscourt" receptions. No finger of criticism, no wave of social ostracism, could ever be directed to "Bishops— court". Particularly was Mrs. Bromby concerned for her family. She provided peace and solitude for her husband and her three sons. It was easy to think at "Bishops court," easier still to pray. The younger Bromby recalled how he liked to sit in his attic to read, and kneel there to pray, "chiefly because I could hear the quiet peaceful sound of your voices beneath me". The Bishop found solace at "Bishopscourt". He was often tired, his rather weak voice required frequent rests, his sensitive spirit brought bouts of nervous exhaustion. Moreover, he was a thinker and dreamer. "Bishops— court" with its sloping gardens, and its glorious view across hills and waters, was for Bromby a haven of peace. At "Bishopscourt", Mrs Bromby, the Bishop and Dean had with them Gertrude, "Minna" Agnes, Edith, William and later, Charles. As these children entered adulthood, they exerted a strong influence in the Cathedral city. Gertrude was devout, a close companion of Henry. She kept house for him in Hobart for eleven years. Ellen, who was always called "Minna", married John Crittenden Mace, of Buckland district in the southern archdeaconry. Their family of five children added a gaiety to "Bishopscourt," a gaiety which, in after years, the Bishop was frequently to recall. Mace was eventually ordained. He assisted the younger Bromby at the Cathedral, was assistant Registrar of the Diocese, and during the family's absence in England in 1880:1881, he acted as Registrar and custodian of the Bishop's home. Agnes and Edith remained unmarried. They became indefatiguable workers in the "Wapping" Mission district and in the Cathedral Sunday Schools ; where they both taught and directed the music. Agnes Bromby also instructed night classes at the Cathedral Parish Schools, where she was singularly successful. Charles Hamilton, the second son, did not arrive in Hobart until December 1874. Having received his early education at the Cheltenham College and St Edmund's Hall, Oxford, he had become a student in the Inner Temple on 7 June 1864, just prior to his family's coming to Tasmania. He had been called to the Bar on 18 November 1867. In Tasmania, he decided to settle in the North, so stayed but irregularly at "Bishopscourt". He was M.H.A. for Launceston 1876:1877 and for Longford 1877:1878. He became Attorney General in T.H. Reibey's Ministry and a member of the Executive Council 20 July 1876: 9 August 1877. He was admitted a member of the New South Wales Bar in 1881. The youngest surviving son, William Mollison, added a touch of gentle mysticism to the home. He wrote poetry and grew hops'. William had a farm at New Norfolk, near Hobart. He married the daughter of R. V. Legge, of Cullenswood in the northern archdeaconry. In 1879, he started a Preparatory School in Hobart, which was ultimately, housed at "Thornycroft" in Macquarie Street. 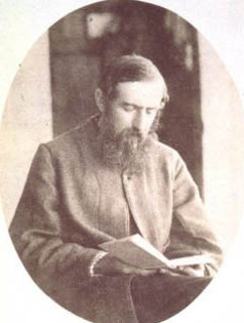 William was a very successful teacher: parents wrote of him - "His aim seemed to be to make Christian gentlemen"; "I can never feel grateful enough for the moral influence he exercised". He died in June 1881, a young man of thirty-three. He was buried with his infant daughter in Sandy Bay. The relatives who most frequently visited "Bishopscourt" were from Melbourne. "Uncle John" came often. He retired from the Headmastership of Melbourne Grammar School at the beginning of 1875. He took charge of St John's, Toorak, Melbourne, during W. Fellows' absence in England. A man of great energy, wiadom and learning, it was widely rumoured that he succeed C. Perry as Bishop of Melbourne. His son, Christopher, was ordained and served in Tasmania, where he was stationed at All Saints' Hobart. Such was the "Bishopscourt" of Charles and Mary Bromby.